Working with nature has always been at the center of my art making process, this may take the form of images or working directly out in a landscape. Rather than manipulate nature, I am interested in understanding how we identify as nature and where biology and creatively overlap. So I am most satisfied when there is a transparency to the work, were nature and human nature are indistinguishable, and a self- awareness of “biologically belong to the world”. In 2015 I began planting tree markers in the wetlands of Lincoln, Rhode Island as an empathic/existential response to nature. This work developed into planting trees in Historical Graveyards in northern Rhode Island. The historical graveyard plantings make sense both with regard to the grave markers themselves which were marking time and loss and my planting Dwarf Alberta Spruce trees also marking loss and remaining roughly human size during there slow growing period. I check in on the health of my tree-marker plantings from time to time, in a number of years I should have human size trees inhabiting the graveyards of northern R.I. . This work is very satisfying I feel complete once I have planted a tree-marker, the tree planting project will continue in the spring of 2019 as there are many more sites that need marking. The 2018 Tree Farm exhibit at URI is an extension of the Planting Project. Here I am bringing the trees indoors so that guests who choose to might plant them anywhere. I have never created any “social sculpture” before this, but as URI students will be planting trees from the Art Department’s Project Space I am curious how cultural planting will alter the planting experience. Simultaneously, I have been making paintings. 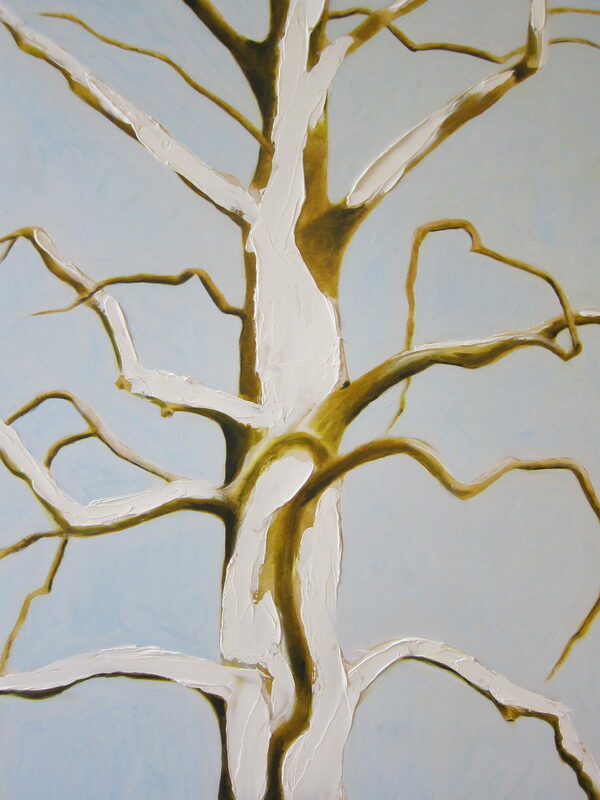 The “white tree” ( either dead trees or winter trees) subject matter runs through all of the 2017-2019 paintings and these are an attempt to bring my drawing process and my painting practice together, consequently, the works are more immediate and fluid. I work from photographs I take of trees. The visual chaos of the branches growing in random directions toward the sun light is quite exciting as a visual record of random growth. The multidirectional reach, the twists and turns capture and hold an image of the invisible, slow movement of organic life.